Sorry, ladies, but when it comes to questionable online information, it looks like men have the upper hand. A new study breaks down Wikipedia users by gender -- and, whether it's reading or writing, this is one domain the dudes definitely dominate. The study, conducted by the Wikimedia Foundation and previewed in a Wall Street Journal blog, finds an overwhelming 87 percent of Wikipedia contributors are men. 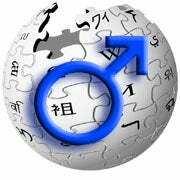 Even when it comes to simply browsing and reading, the ratio still skews toward the guys: Sixty-nine percent of Wikipedia readers are male, the study indicates. • The average Wikipedia-using guy is 26; the average Wikipedian woman is 24. • About a fifth of the users hold a graduate degree. • The main reasons people don't contribute are lack of time (translation: better things to do), satisfaction with simply reading entries (translation: better things to do), and lack of knowledge on how to actually edit the pages (translation: better things to do). The complete study is set to be released in November, after which point a Wikipedia page about it will presumably surface...and soon thereafter be desecrated with erroneous information. JR Raphael regularly mocks technology at eSarcasm, his new geek humor site. You can keep up with him on Twitter: @jr_raphael.